A black and white negative of a portrait of Mr. Andrew Ferrier Rankine (1918-1975). Andrew Ferrier Rankine was born at Perth, Perthshire, Scotland, on January 1, 1918, and came to Canada after 1953. He worked as a shipping foreman for Nabob Foods, Ajax. He served in the Second World War and was President of the Royal Canadian Legion Branch 112, Whitby in 1972-73. He was a member of the David T. Campbell Lodge and a Principal of Keystone Chapter, Royal Arch Masons in 1972. Mr. Rankine died at Whitby on February 11, 1975 and was cremated. 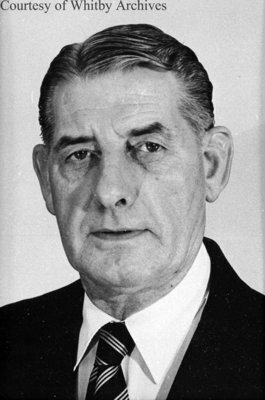 His brother, George Rankine, was Whitby Police Chief from 1956-1968. Andrew Ferrier Rankine, 1973, Photographer Unknown. Whitby Archives A2016_017_042A.